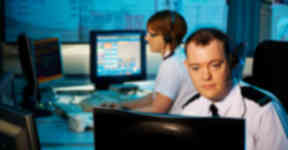 The service will connect callers directly with their local police station and ease the strain on the 999 system. A new national phone line for non-emergency calls to the police has gone live. The 101 number aims to take the strain off the 999 service by giving people an alternative way to report non-urgent crimes, pass on information or get advice. Calls to 101 will cost 15p from both landlines and mobile phones, with an automatic system detecting the caller's location before connecting them to their nearest available police station. Justice secretary Kenny MacAskill, who visited one of the 101 call centres on Thursday to launch the service, said: "The introduction of 101 will provide the public with an easy to remember number to use when they want to contact police when an emergency response is not required. "The public should use this number to report crimes such as car theft, damage to property; if they have information about suspected drug use or drug dealing or if they wish to pass on information to officers. "101 will undoubtedly help to keep people safe and will make the police response more efficient for everyone in Scotland." Deaf, hard of hearing and speech-impaired callers can access the service via TextRelay on 1 800 1 101. Police said 999 should still be used for genuine emergencies and urgent situations where a crime is in progress, a life in danger or a suspect nearby.